I decided to add more some more functionality to my Application Settings addin. 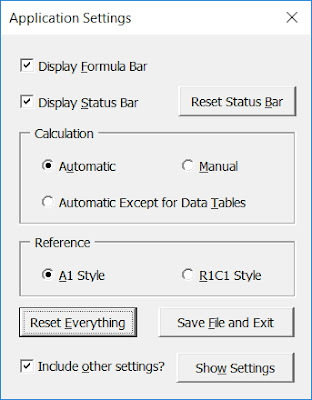 In fact, I also changed the name to Excel Settings. (It's actually a different file, so please be sure to click "Check settings when opening/saving files" on the menu if you want these to fire). What's new? As you can see, I added 2 new sections for Workbook Scope and Worksheet Scope settings. The picture pretty well speaks for itself. And, if your file is saved (has a path), you can see File Size, Last Saved (Date and Time) and Last Edit (Author) details. 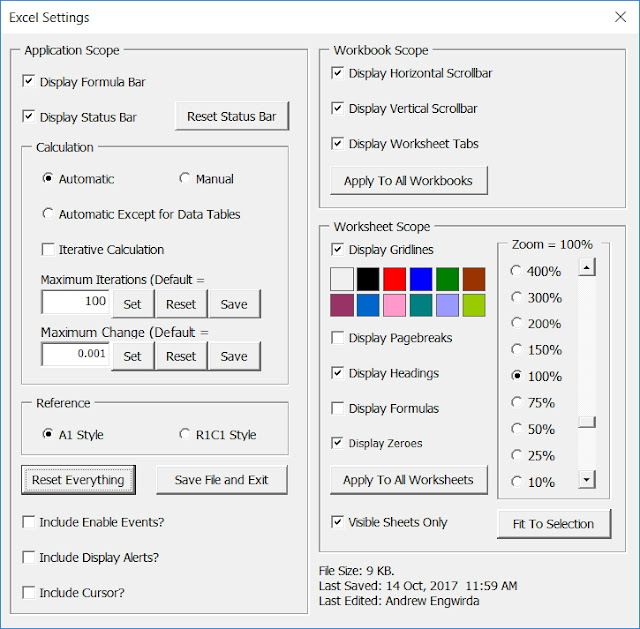 I made a new version of my Application Settings addin as per Sébastien's comments in my last post (mirrored on the Daily Dose of Excel). The problem, as I see it, is not switching it back to xlCalculationAutomatic. 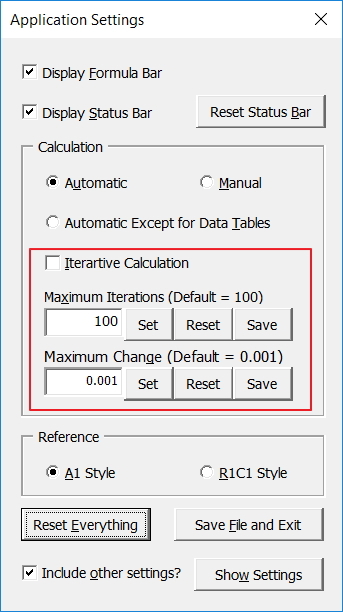 Given that some people for whatever reasons might use Manual Calculation all the time, most people don't, especially the vast majority of average users who probably haven't heard of this setting. With Calculation still set to Manual, they might be looking at values that haven't be updated. Even experienced programmers might be temporarily confused until they figure out what's going on. Imagine someone in a sales department quoting incorrect pricing to a customer or doing a faulty presentation at an important meeting. Not good. I've found it useful, but since then I've thought there's room for improvement, so I made something new. As you can see there's 3 menu items. 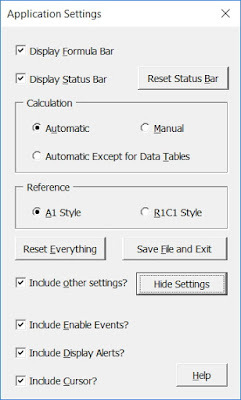 The bottom 2, when toggle to "On", check files when opened/saved for the following settings. Click the form's controls to reset them individually, or just click the Reset Everything button, then the Save File and Exit button if you choose to. Alternatively, click the X button not to save the file. Note that any other file that are open will also be saved with these settings (unless you change them later), because they are Application settings, not Workbook settings. Keep in mind that these additional settings aren't checked automatically. The form only resets them if you click the Reset Everything button as mentioned above. Also, if Application.EnableEvents is set to False by VBA code, my addin won't check files when opening or saving as these are the events that trigger it. In fact, you should be setting this False if any of your code does open or save workbooks to prevent my code from running, then set it back to True before the code ends. 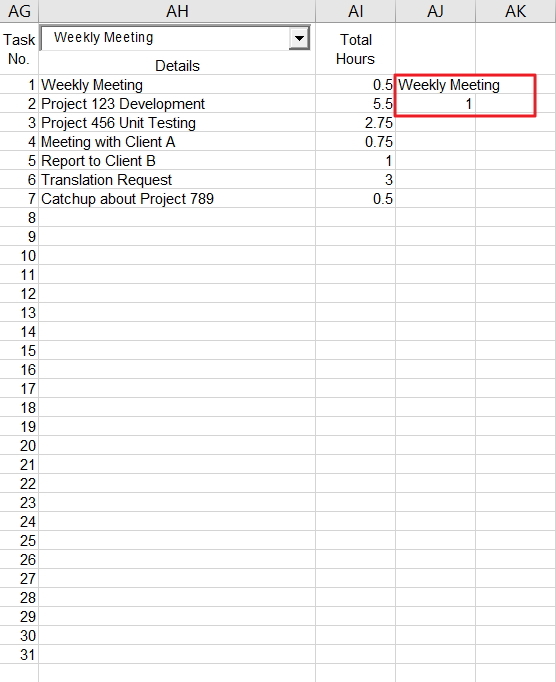 At a former client, I was asked to submit monthly reports that show details of work performed in 15 minute increments. 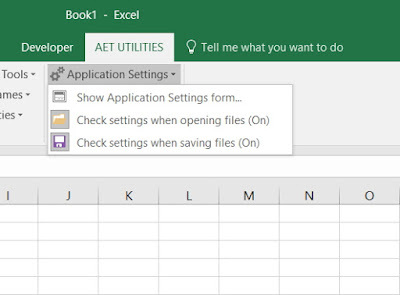 "Let's see, a monthly calendar, something like the one on my fridge door comes to mind and making one in Excel should be easy..."
One problem is space. If I do several tasks in one day, do I use tiny font to make the details fit, or do I make the calendar larger to the point that I have to scroll copiously? 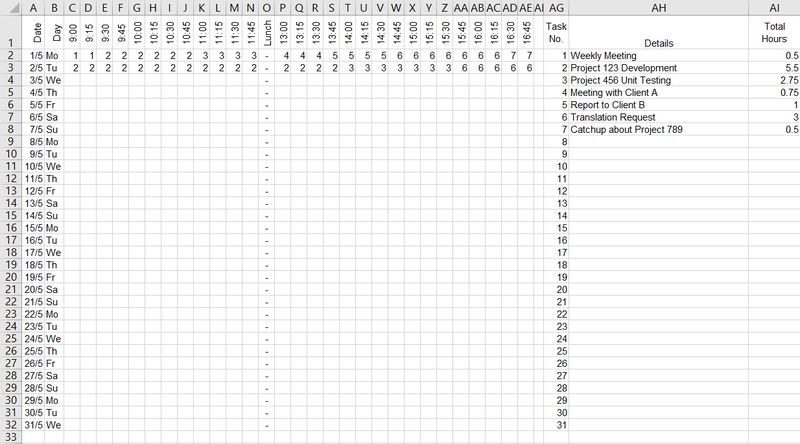 Also, just how practical is that style of calendar going to be when it comes to adding up total time per task? Something along the lines of a regular timesheet would be better. 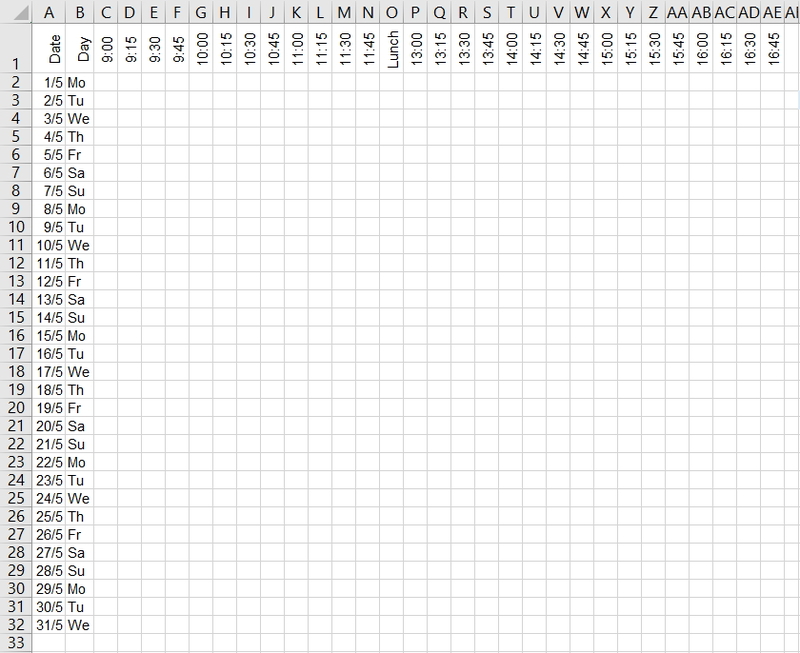 I can easily fit 32 rows on my laptop screen. That's a good start. So here's how to do the same thing I did, if you are interested. Leave the first row for your headers. 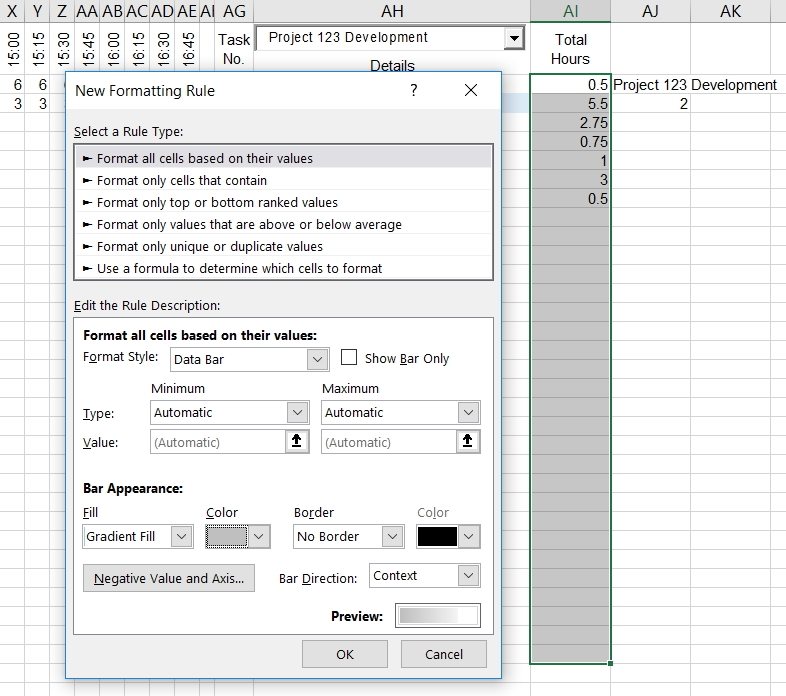 In cells A1 and B1, enter "Date" and "Day", then change the orientation. 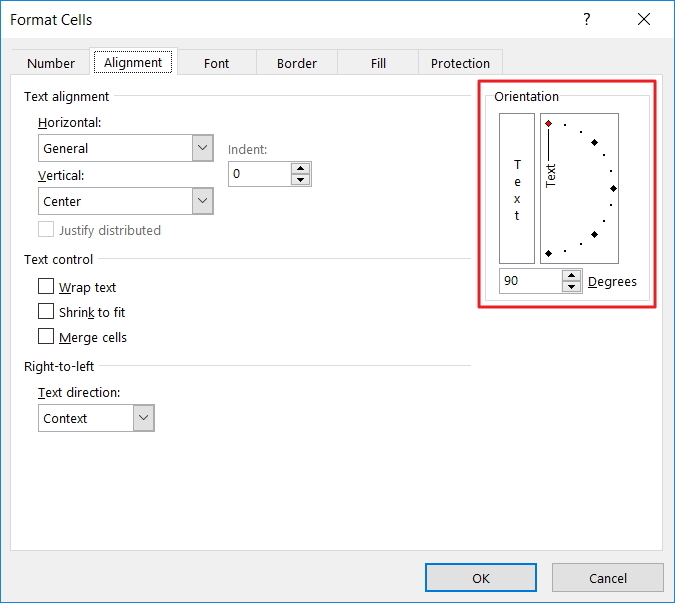 Right click the cells, select Format Cells, Alignment, and change Orientation to 90 degrees. Enter the first day of the month in cell A2. 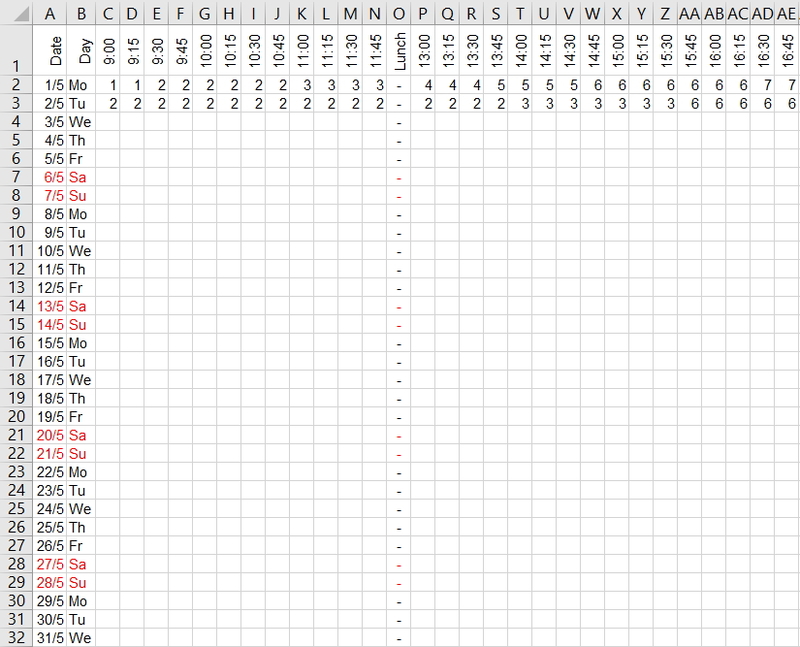 Select range A2:A32, then change the format to either "d/m" or "m/d" as you prefer. 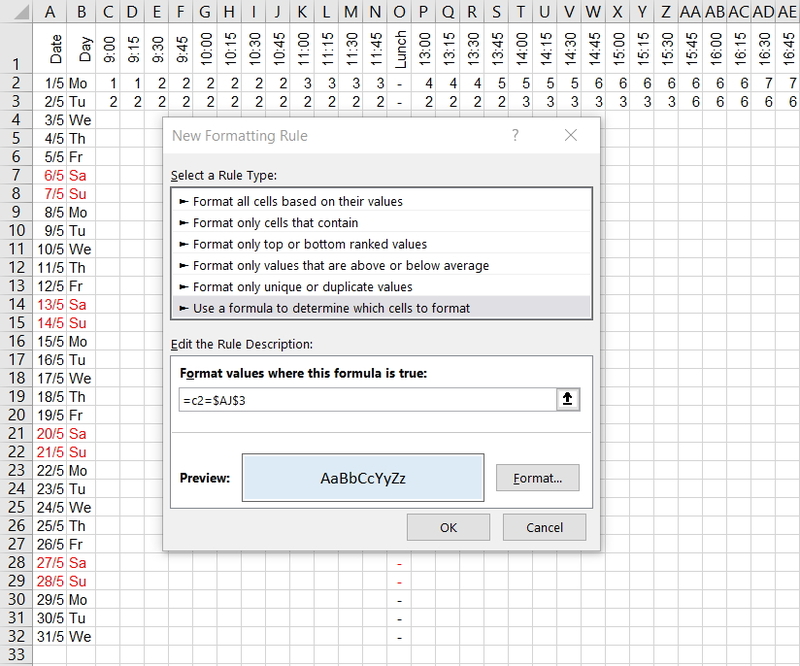 Right click the cells, select Format Cells, Number, and enter the format in the Type text box in the Custom section. 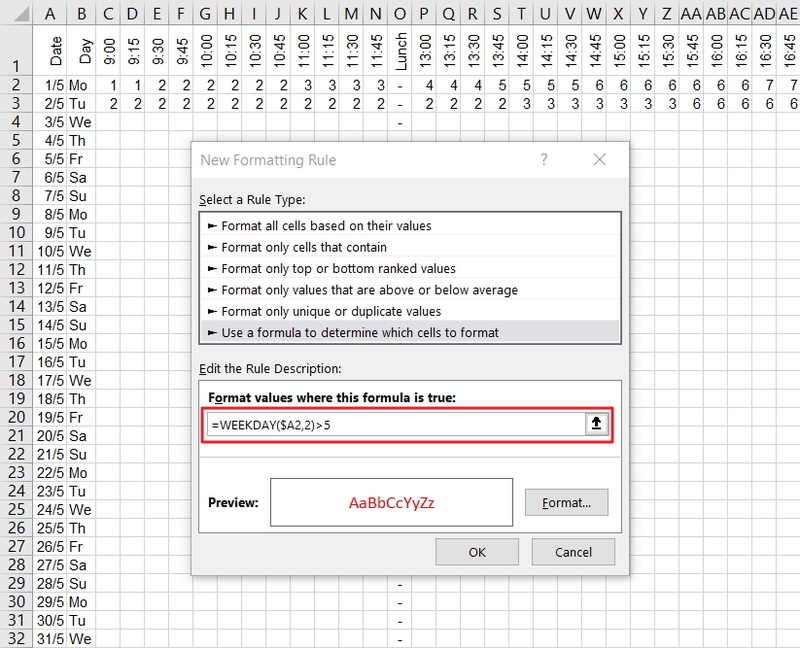 Now enter =A2+1 into Range A3:A32 and click your Ctrl and Enter keys simultaneously to enter the formula into all selected cells. In the same way, enter =CHOOSE(WEEKDAY(A2,1),"Su","Mo","Tu","We","Th","Fr","Sa") into Range B2:B32. Adjust the width of both of these columns and set the alignment to suit. And now for the details. Long descriptions take up space, so let's use numbers instead. Keep in mind that longer tasks won't be completed in 15 minutes, and recurring tasks will be duplicated so that's going to cut down the number of tasks in total. With any luck, we can keep things within double digits. Start times allotted for the 15 minute intervals go in Row 1. Adjust the Orientation to 90 degrees. "h:mm" is a suitable format. The task descriptions that match the numbers can go on the right. But note the numbers to their left to perform a lookup. Important: adjust the following ranges to suit your requirements. Use Named Ranges if you prefer. 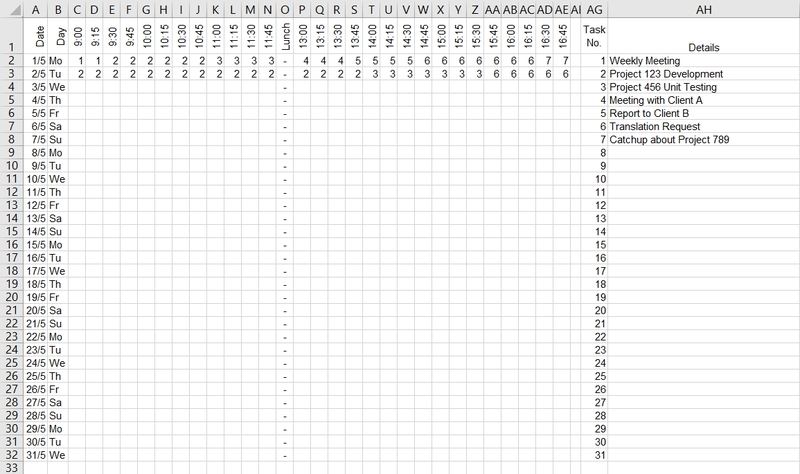 Enter formulas to add up the time. 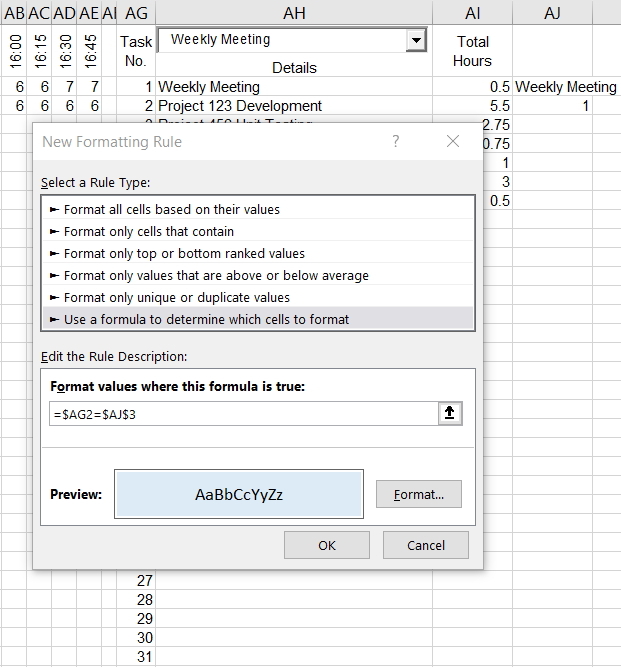 Type the following formula into Cell AI2, and drag down to the end of your list. 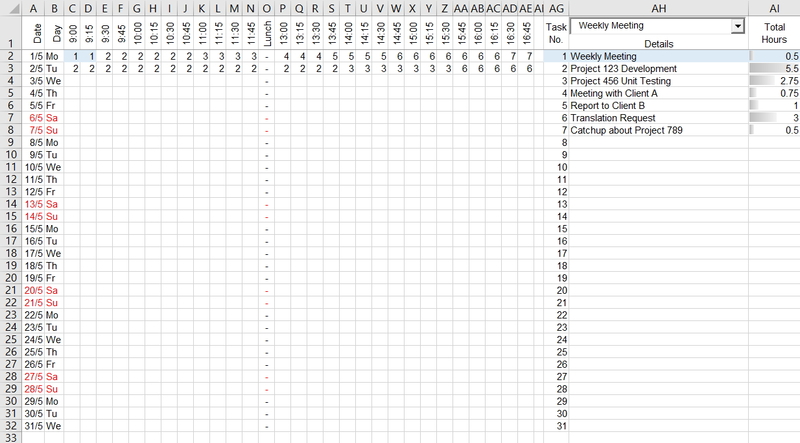 An ActiveX Combo Box and a bit more Conditional Formatting makes it easy to see when the work was done. If you can't see the Developer Tab on the Ribbon, select the File Tab, Options, Customize Ribbon, then tick "Developer" on the list to the right and click the OK button. 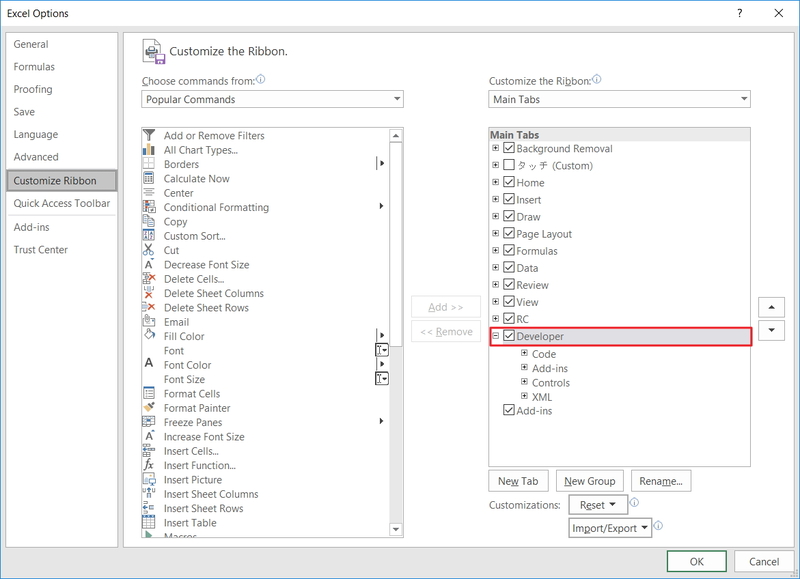 Right click the Combo Box and select Properties. Set the LinkedCell and ListFillRange properties. I've hard-coded my ListFillRange range reference but you can use Named Ranges too, as in "=Tasks" without the quotation marks. When finished, toggle off Design Mode on the Developer Tab. Note the linked cell. That gives me the selected item of the list. 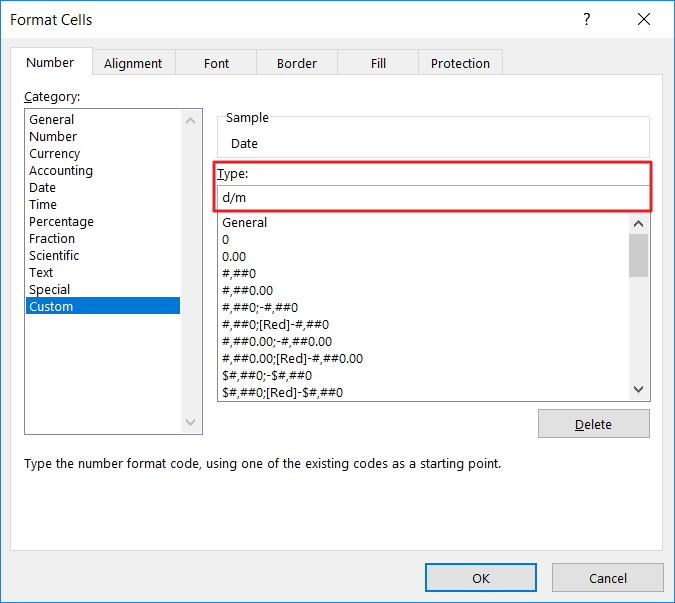 Now I use another formula to get the reference number which I have put in the cell below the linked cell (In this case, Cell AJ3). If I select the first item on the Combo Box, Cell AJ3 will show 1. I also added some Data Bars to the hours. No VBA was used so you can send the file without explaining the need to enable macros. Here's a download link if you want to skip making one yourself. Yet another tool has been added! 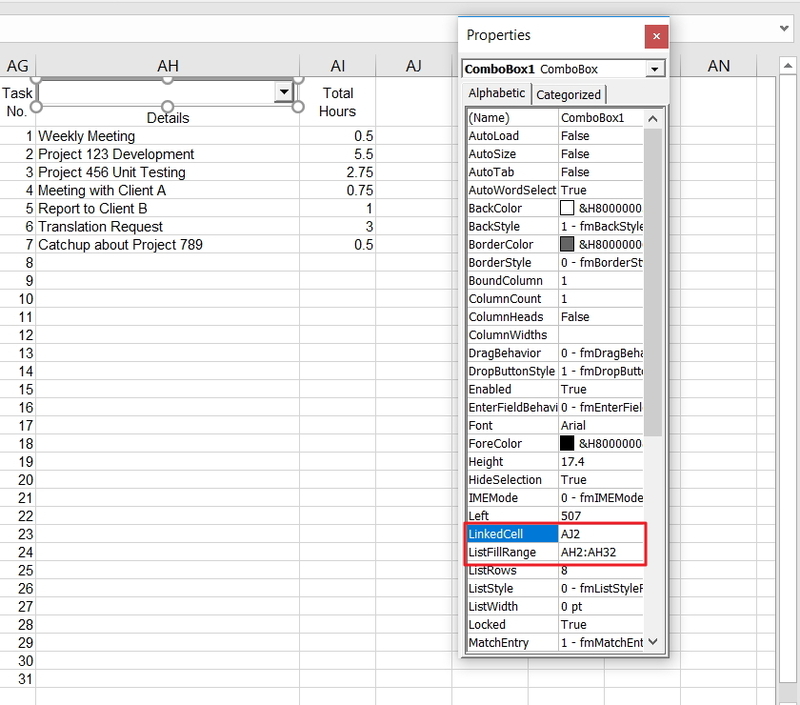 You can now run a report that shows project statistics. It's a good way to get a general feel of how much work you have done, and where it is located. P.S. If you have purchased an earlier version, contact me by email and I'll send a new set of tools - free of charge!